Homicide detective Mandi Murphy had seen enough bloodshed on the streets of Houston to last a lifetime. After a botched drug bust left a friend dead, she wanted out of the city. Peaceful little Sawmill Springs seemed like the perfect spot to start over. Six weeks on patrol proved the town to be as quiet and serene as she’d imagined. When things soured between FBI agent Kayla Dixon and her lover, she was ready for a change from the fast paced life she was living. Her father, the Police Chief in Sawmill Springs, offered her a job and she decided a change of pace was just what she needed. Her wish for slow and peaceful didn’t materialize, however, as mere hours after she starts her first shift, a prominent citizen is gunned down. 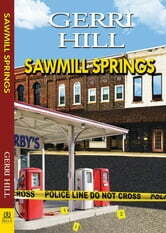 The two women are thrust together to solve the murder and return Sawmill Springs to the sleepy small town the residents expect. As the investigation grows, so does their attraction. There’s just one problem—Murphy thinks Kayla is straight. Kayla admits to a failed marriage when she was eighteen and an ambiguous affair with another FBI agent convinces Murphy to steer clear of her. Kayla’s innocent flirting is met with skepticism and doubt…and temptation. Another murder not only strengthens their bond as partners but has them fighting to escape the clutches of a murderer. No longer able to ignore the budding attraction between them, they must decide if they are willing to start over…this time, together.